Home / Health and Lifestyle / Parenting / Why ICSI treatment has become a boon for couples facing infertility. Why ICSI treatment has become a boon for couples facing infertility. Intracytoplasmic Sperm Injection (ICSI) is a very prevalent, common and successful treatment for male infertility. The procedure of this treatment is to inject the sperm into the egg directly. It is a ray of hope for those couples who suffer from the pain of not able to become a parent. Those who are undergoing the treatment named ICSI the couples are now being able to experience the parenthood. The outer layer of the egg has to be penetrated by the head of the sperm and then, the head of the sperm has to reach the cytoplasm to make this fertilization successful. There are so many leading hospitals where you can avail ICSI in Bangalore. In approximately half of the IVF procedures, ICSI is involved. Generally, in a culture dish, the eggs are mixed with the sperm and in that way, fertilization takes place in an IVF cycle. However, if this does not happen naturally on its own, the help of ICSI is taken and into the matured egg, sperm is injected manually. After the sperm is injected into the egg, it is kept for one to five days in the laboratory and it grows in that period. When the ideal time arrives, the embryo is moved into the womb subsequently. It takes around four to six weeks for a series of Intracytoplasmic Sperm Injection to get fulfilled and completed. Once the embryo is transferred to the womb, it is prescribed to visit a fertility hospital within two weeks for a checkup. For ICSI in Bangalore, get an appointment from any of the numerous leading fertility clinics. The success rate of ICSI is pretty good. After ICSI, the rate of fertilization lies between 50%-80%. Men of young age witness higher success rate whereas the success rate for the men above of the age of 35 is lower than that. ICSI is undoubtedly an effective method but there are certain risks associated with it as well. Such as- into the embryo the fertilized egg may not get properly, the growth of the embryo may get ceased even after the sperm is injected, some eggs may get damaged due to ICSI, the male progeny born out of ICSI may get the symptoms of infertility passed on by the father of the progeny. 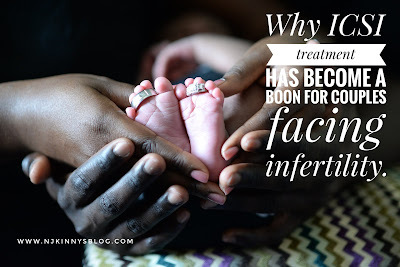 So, there are both pros and cons of the ICSI treatment. If precautions are taken properly and all the procedure followed systematically, then your life will be full of joy after this treatment.